A World Restored: Metternich, Castlereagh and the Problems of Peace, 1812-22, (Weidenfeld & Nicolson, 1957). Nuclear Weapons and Foreign Policy, (Harper & Brothers, 1957). The Necessity for Choice: Prospects of American Foreign Policy, (Harper, 1961). The Trobled Partnership: A Reappraisal of the Atlantic Alliance, (McGraw-Hill, 1965). American Foreign Policy, (Weidenfeld and Nicolson, 1969). White House Years, (Little, Brown, 1979). For the Record: Selected Statements 1977-1980, (Weidenfeld and Nicolson and Joseph, 1981). Years of Upheaval, (Weidenfeld and Nicolson, 1982). Observations: Selected Speeches and Essays, 1982-1984, (Little, Brown, 1985). Diplomacy, (Simon & Schuster, 1994). Years of Renewal, (Simon & Schuster, 1999). Does America Need a Foreign Policy? : Toward a Diplomacy for the 21st Century, (Simon & Schuster, 2001). Ending the Vietnam War: A History of America's Involvement in and Extrication from the Vietnam War, (Simon & Schuster, 2003). Crisis: the Anatomy of Two Major Foreign Policy Crises, (Simon & Schuster, 2003). On China, (Allen Lane, 2011). Problems of National Strategy: A Book of Readings, (Praeger, 1965). 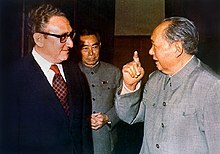 The Kissinger Transcripts: the Top Secret Talks with Beijing and Moscow, ed. by William Burr, (New Press, 1999). Marvin L. Kalb and Bernard Kalb, Kissinger, (Little Brown, 1974). William Shawcross, Sideshow: Kissinger, Nixon, and the Destruction of Cambodia, (Simon and Schuster, 1979). Seymour M. Hersh, The Price of Power: Kissinger in the Nixon White House, (Summit Books, 1983). Michael Joseph Smith, Realist Thought from Weber to Kissinger, (Louisiana State University Press, 1986). 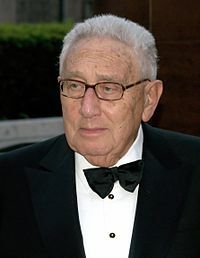 Robert D. Schulzinger, Henry Kissinger: Doctor of Diplomacy, (Columbia University Press, 1989). Gerry Argyris Andrianopoulos, Kissinger and Brzezinski: the NSC and the Struggle for Control of US National Security Policy, (Macmillan, 1991). Walter Isaacson, Kissinger: A Biography, (Simon and Schuster 1992). William Bundy, A Tangled Web: the Making of Foreign Policy in the Nixon Presidency, (Hill and Wang, 1998). Christopher Hitchens, The Trial of Henry Kissinger, (Verso, 2001). G.R. Berridge, Maurice Keens-Soper and T.G. Otte (eds.) Diplomatic Theory from Machiavelli to Kissinger, (Palgrave, 2001). Jussi Hanhimaki, The Flawed Architect: Henry Kissinger and American Foreign Policy, (Oxford University Press, 2004). David J. Rothkopf, Running the World: The Inside Story of the National Security Council And the Architects of America's Power. (Public Affairs, 2005). Bruce Kuklick, Blind Oracles: Intellectuals and War from Kennan to Kissinger, (Princeton University Press, 2006). 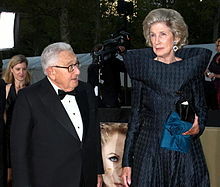 Jeremi Suri, Henry Kissinger and the American Century, (Harvard University Press, 2007). Robert Dallek, Nixon and Kissinger: Partners in Power, (Harper Collins, 2007). Holger Klitzing: The Nemesis of Stability. Henry A. Kissinger's Ambivalent Relationship with Germany. (WVT 2007). ^ David J. Rothkopf, Running the World: The Inside Story of the National Security Council And the Architects of America's Power. (Public Affairs, 2005), chap.6. The BCCI Affair A Report to the Committee on Foreign Relations, United States Senate, by Senator John Kerry and Senator Hank Brown, December 1992 102d Congress 2d Session Senate Print 102-140. Kissinger Associates, BNL, and Iraq Henry B. Gonzalez speech in Congress, May 2, 1991.